Eyelids are protective curtains in front of eyes which give shape and beauty to the face. Any defect or injury to eyelids due to trauma or surgical excision needs to be meticulously repaired for the best possible cosmetic outcome. Road traffic accidents, blasts, and falls are the major causes resulting in injuries to eyelids. 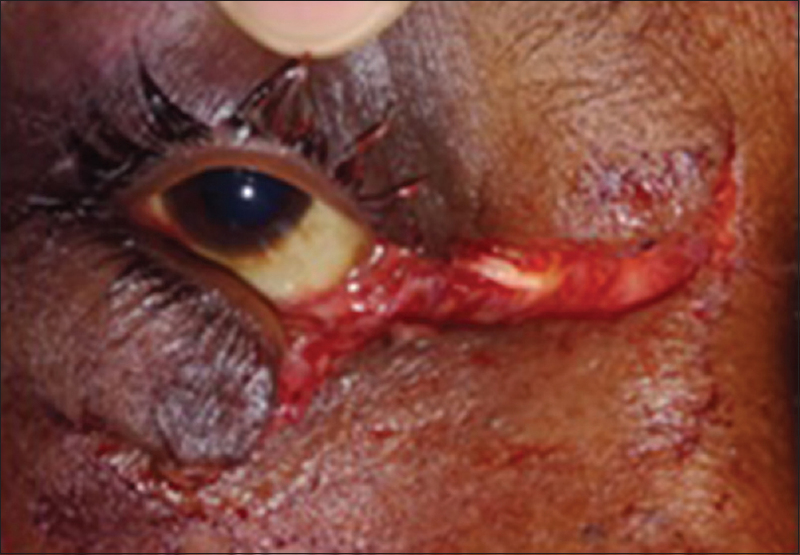 Traumatic laceration to the eyelid requires a thoughtful, well-planned approach in order to provide the best outcome and reduce the chances of postoperative complications. 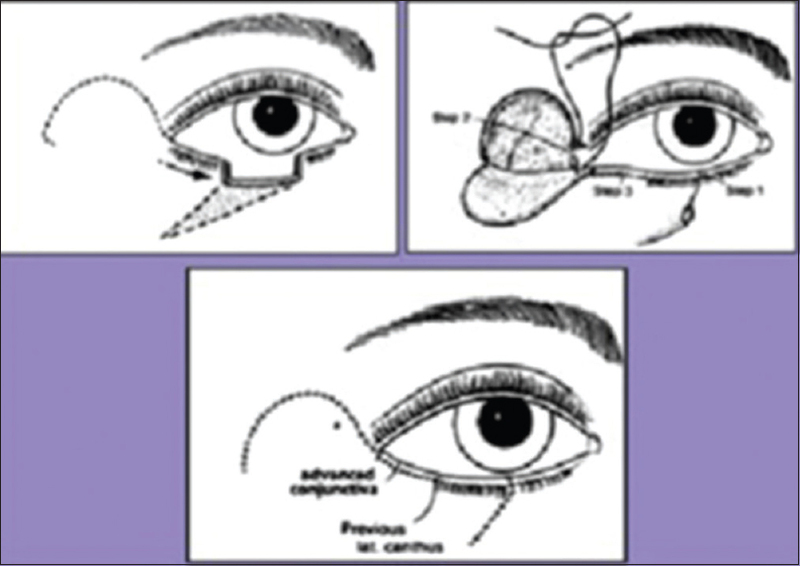 Eyelid margin has a slightly rounded anterior edge and sharp posterior edge. 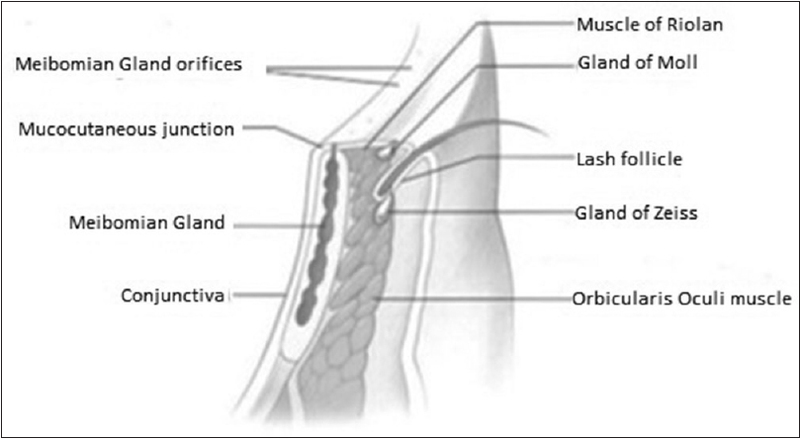 Anatomical structures in eyelid margin are shown in [Figure 1]. Gray line lies anterior to Meibomian gland More Details openings and represents an avascular plane between the orbicularis and the tarsal plate. It is the plane along which the lid can be spilt into two halves. Functional anatomy of the lid can be simplified by dividing lid into two parts along gray line. Posterior lamella – conjunctiva and tarsal plate. Fibrous extension from the tarsal plate forms the canthal tendons [Figure 2]. Canthal tendons maintain horizontal pull on the lids to maintain proper lid apposition. First and foremost is a detailed history regarding the time, course, and circumstances of injury. For full-thickness upper eyelid injuries, never forget to check for globe perforations. Globe injuries should be attended before lid injuries. Eyelid trauma can be associated with hyphema, angle recession, or retinal detachment. Detailed ocular examination includes visual acuity, ocular movements, intraocular pressure, pupillary reactions, and posterior segment examination. Clear watery discharge from one nostril indicates cerebrospinal fluid rhinorrhea and is a red alert sign to look for anterior skull base fractures. We save all eyelid tissues, as high vascularity often allows for viable re-approximation of partially avulsed ocular adnexal tissue [Figure 3]. We photograph all preoperative injuries and immediate postoperative results. A broad-spectrum prophylactic antibiotic cover is preferred (such as amoxicillin-clavulanate or clindamycin for the penicillin-allergic). Tetanus prophylaxis may also be required. 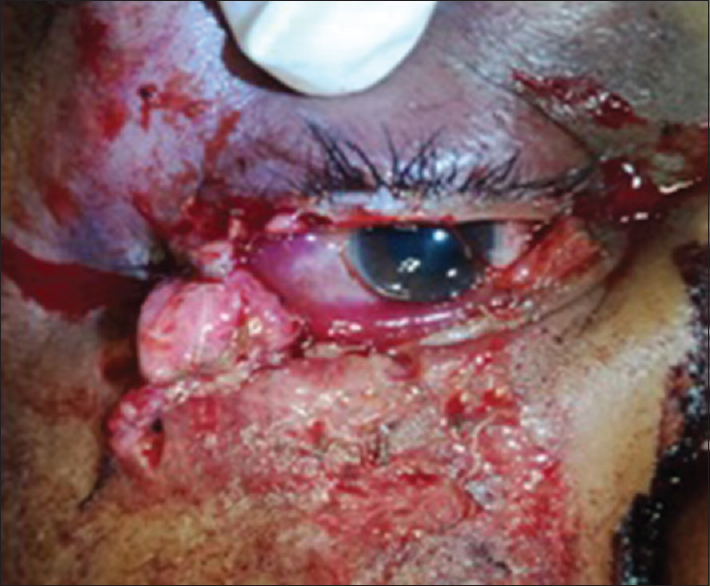 Blunt injury to the medial eyelid with resultant eyelid laceration almost always tears the canaliculus. Telecanthus is noted in case of outfracture of the lacrimal bone or laceration of the medial canthal tendon. 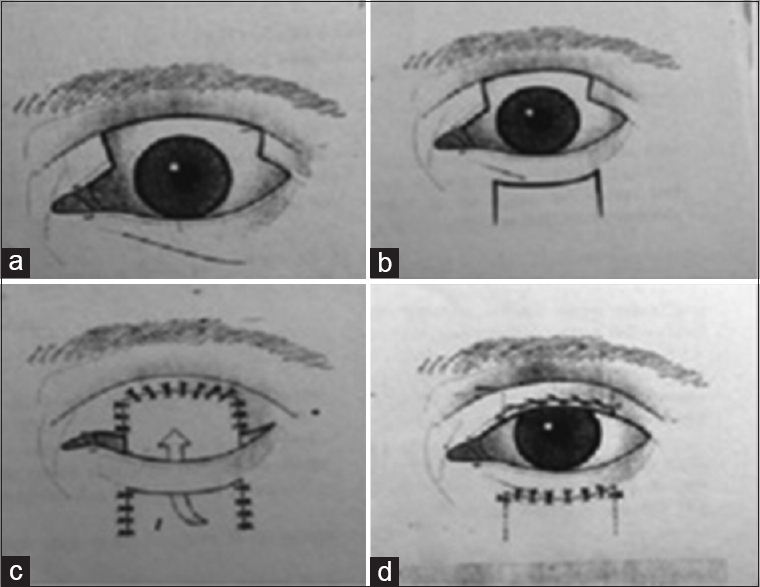 In eyelid lacerations medial to the puncta, the canaliculi should be probed to assess integrity [Figure 4]. We have found that most eyelid injuries can wait 24–48 h for soft-tissue swelling to improve. Most of our cases are operated under local anesthesia. Facial block can be supplemented. We prefer general anesthesia or deep monitored anesthesia care for complex lacerations involving the canaliculi, underlying bone fractures, and when operating on young children. Primary repair of the levator aponeurosis is done by repositioning it to the upper half of the tarsus with permanent 6-0 or 7-0 suture material. Full-thickness lid margin lacerations, canalicular tears, canthal injuries, and lacerations with tissue loss are entities which should be meticulously tackled using specialized techniques. Repair should be carried out preferably under operating microscope. Simple suture in the posterior mucocutaneous junction. All suture ends are left long. The anterior lamella of the eyelid is closed next, with interrupted sutures using 5-0 silk. 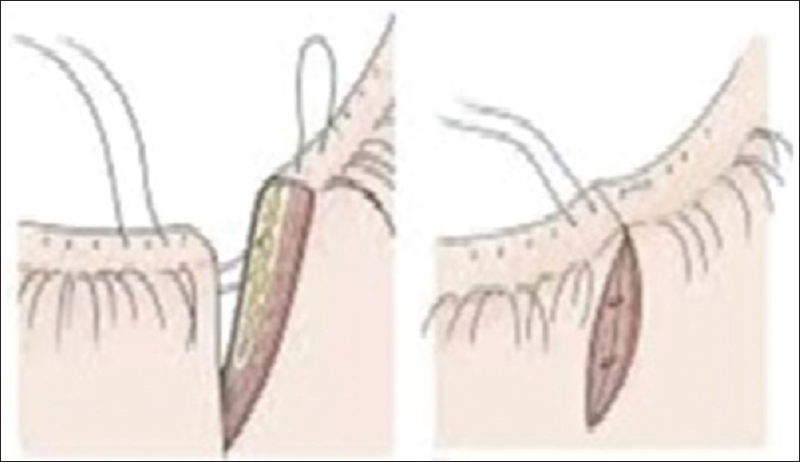 The long end of the margin sutures is buried into the knots of these skin sutures to prevent the suture ends from abrading the cornea [Figure 7]a and [Figure 7]b. Sutures are removed after 2 weeks [Figure 7]c. All tarsal irregularities at the wound edges should be trimmed to allow good tarsal-to-tarsal approximation which prevents tarsal buckling and postoperative notching of lid margin. The rounded configuration of the medial canthus and/or the acute angle of the lateral canthus can be distorted or lost in canthal injuries [Figure 8]. The integrity of the canthal tendon is tested by grasping the lid with toothed forceps and pulling toward the limbus. The avulsed lateral canthal tendon should be sutured or wired at the tubercle so that it is 1–2 mm higher than the medial canthus. The posterior limb of the medial canthal tendon is primarily responsible for the medial canthal configuration. The ruptured tendon can be sutured to the posterior lacrimal crest or as posterior as possible taking special care not to injure the lacrimal sac. The anterior head of the medial canthal tendon can be sutured directly to its anterior lacrimal crest insertion. This is possible because of increased eyelid laxity, especially in older patients. This provides additional horizontal lengthening in lateral canthotomy, and horizontal limb of Y-shaped lateral canthal ligament is incised. For cantholysis, inferior or superior crus of lateral canthal tendon is incised. It can be used for both upper lid and lower lid defects where some tarsus remains on either side of the defect. A high arched semicircular flap of the skin and orbicularis muscle is rotated from lateral canthus after lateral cantholysis. The flap dimensions are 22 mm × 18 mm (V × H). For upper lid defects, the semicircle extends inferiorly, and for lower lid, the semicircle extends superiorly. After undermining of the tissue, the lid is pulled medially and direct lateral canthus is created [Figure 9]. Originally described for reconstruction of the upper lid, this technique can be used for reconstruction of the lower lid defect also, a procedure known as reverse Cutler-Beard. Cutler-Beard procedure is done in two stages [Figure 10]. Figure 10: Cutler-Beard procedure Stage 1: (a) Full thicknes upperlid defect. (b) A three-sided inverted U-shaped incision is marked on the lower eyelid, about 5 mm below lid margin. (c) By a full-thickness incision, the lower lid flap is pulled under the bridge of lower lid and sutured in layers to the upper lid defect. Since this flap is devoid of the tarsus, autogenous cartilage from the ear can be used. Stage 2: (d) Separation of the flap at 6 weeks to 3 months. 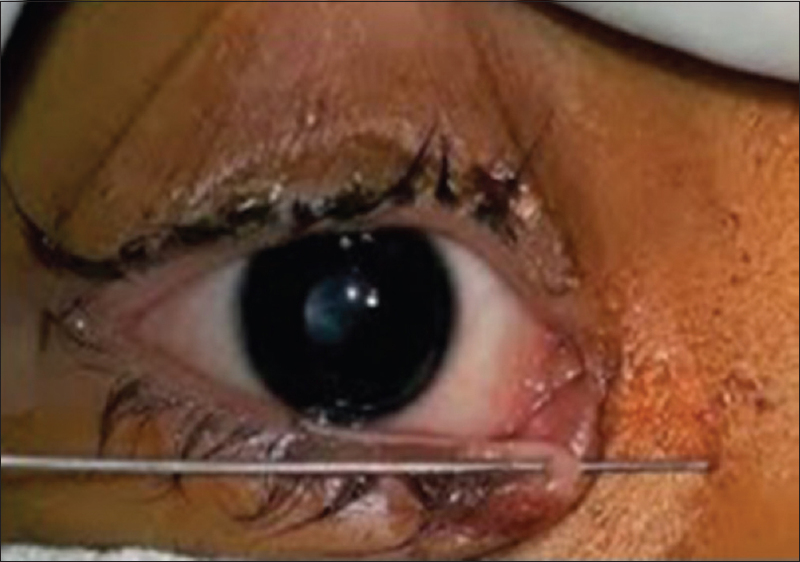 After cutting the flap, lid margin of newly formed upper eyelid is sutured with conjunctiva covering the free margin. It is partial-thickness posterior lamellar flap harvested from upper lid to cover lower lid defects [Figure 11]. It is reserved for the reconstruction of very extensive lower eyelid defects usually involving more than 75% of the eyelid. The side of the triangle nearest the nose should be practically vertical. 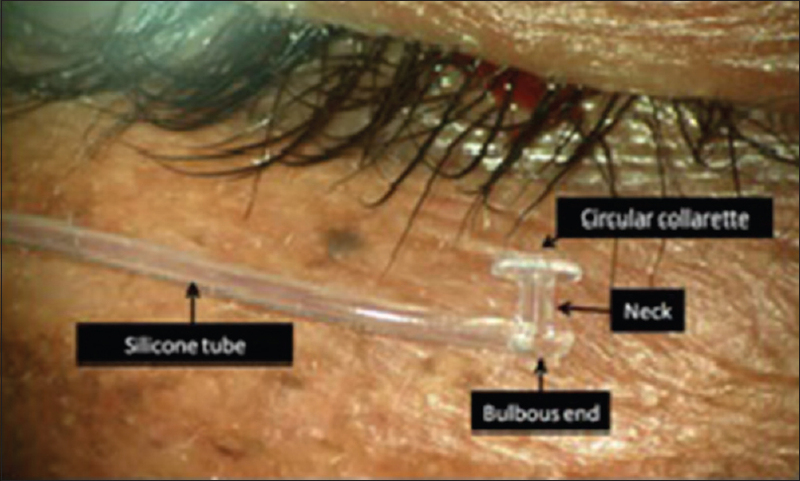 The advantage of this procedure is that it is a one-stage, complete lower lid reconstruction [Figure 12]. 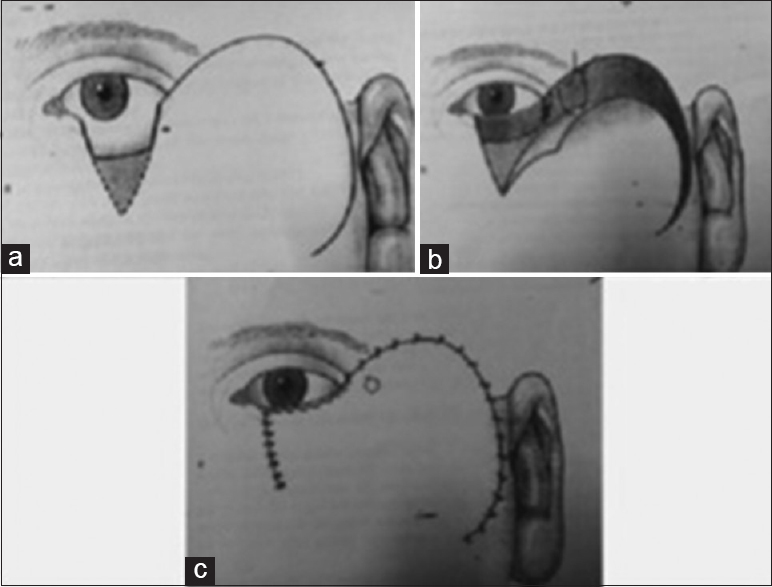 Figure 12: Mustarde cheek rotation flap. (a) A large myocutaneous cheek flap is dissected and used in conjunction with an adequate mucosal lining posteriorly. (b) A deep inverted triangle must be excised below the defect. The side of the triangle nearest the nose should be practically vertical. (c) Adequate rotation and suturing of the flapto cover the defect. Dyes such as methylene blue or diluted fluorescein can also be used. If proximal end is crushed and cannot be retrieved, eyelid should be closed without further manipulation. Angiocath I/V cannula 22 gauge. Mini-Monoka monocanalicular stents are used in our hospital with excellent postoperative results [Figure 13] and [Figure 14]. It has a self-retaining cap which sits at the punctum giving it excellent stability and avoids extrusion or displacement of stent. It also has the advantage of not disturbing the uninjured canaliculus. Only disadvantage is the high cost of stent. -Mini-Monoka removal is done at 3 months. At all follow-up visits, meticulous chart documentation is critical, and supplemental photographic documentation is desirable. Dutton JJ. Atlas of Clinical and Surgical Orbital Anatomy. Philadelphia: Saunders 1994:126. 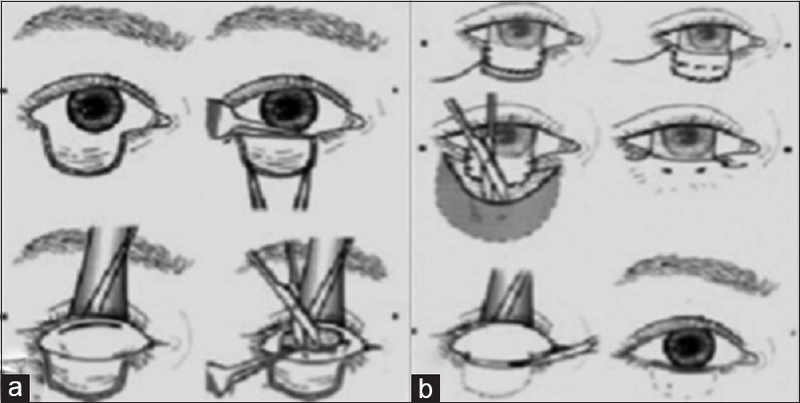 Vichare N. Management of lid lacerations ocular trauma. Delhi Ophthalmol Soc Times 2015;20:33-8. Nelson CC. Management of eyelid trauma. Aust N Z J Ophthalmol 1991;19:357-63. Carroll RP. Management of eyelid trauma. In: Hornblass A, editor. Oculoplastic Orbital, and Reconstructive Surgery. Vol. 45. Baltimore: Williams & Wilkins; 1988. p. 409-14.